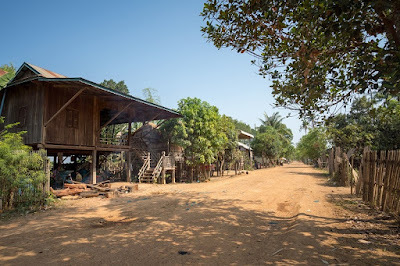 Roeun Loth is an 8-year-old girl living in Srah village, Thmei commune, which is about 30 kilometers away from the town of Kratie province. The community where Loth’s family resides is far from the commune, which makes the accessibility to education a challenge for a little girl like her. She was born with a disability in her leg and arm. Loth didn’t have enough courage to go to school as she feared receiving discrimination. Loth (2nd from left) with her mother, father and twin sister. Nhek Bolly, a Commune Focal Point for Women visited Loth and her parents at home. Bolly encouraged Loth by telling her to: ‘Fight for her education’. Despite all the challenges, Loth overcame the fear and gained more confidence. With support from her parents, Loth is now in grade 2 and she is highly engaged in class activities such as doing presentations using a whiteboard and reading poems. She is a confident girl and is determined to become a teacher when she grows up. “My disability is by nature and is nobody’s fault.” She said. Roeun Chenu is a boy who laughs at the pronunciation of the Khmer word ‘Thanu’ as it sounds like his name ‘Chenu’. Becoming an office worker is what Chenu has been dreaming of since he was little. Chenu is living with a caregiver family in Trapeang Traing village, Kratie province. 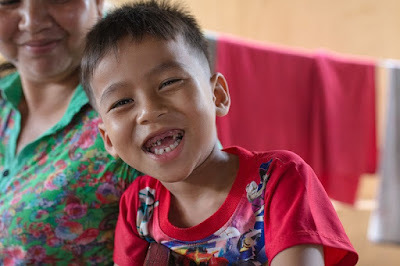 When he was 4, he suffered an ear infection that caused him hearing loss and since then he speaks slowly word by word and sometimes his sentences are incomplete. As Chenu liked to be alone without having much interaction with the surrounding environment, Toun Sokhy, his caregiver enrolled him at a community preschool. He couldn’t go to school alone, so his grandmother went to school with him for the first two weeks. He also refused to sit in the classroom and decided to learn outside the classroom. After receiving an early childhood education training, Ms. Nara who is Chenu’s teacher has strengthened her knowledge on delivering learning sessions to her students, especially vulnerable children like Chenu. Thanks to his teacher’s guidance, Chenu is now able to go to school on his own with confidence and he can participate and engage in class. After 18 months of going to school, Chenu’s life has changed for the better. Chenu’s caregiver, Sokhy, says with a smile, “Every morning, Chenu is very well prepared to go to school and looks forward to meeting his friends and learning new things”. In a remote village in Kandal province, Nary is an 8 years old girl who loves to go to school every day despite her difficulties of catching up in class. Nary is suffering from a delay in her development. Ms. Phal Samphous, Nary’s mother, noticed her daughter was different when Nary was two years old. 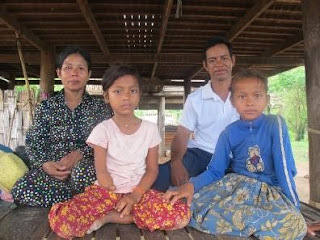 Since Nary is the only child with a disability in her school, she wasn’t receiving any extra support from her teacher. Two years ago, Phal heard about a support group and received training from the group for parents who have children with disabilities. The support group is run by the NGO Center for Child and Adolescent Mental Health (CCAMH). Phal loves the support group and she has gained a lot of knowledge regarding how to teach Nary to perform daily tasks. Thanks to the lessons received from her mother, Nary is now able to dress, groom herself, eat and clean on her own and without her mother’s assistance. Makara smiles as he stood on his own, and soon toddled back to his father. Even though Makara often falls he always gets up by himself and walks step by step with hope. At the age of six, Makara made his first stand on the ground. Makara has been affected by Cerebral Palsy (CP), a condition which caused damage to the development of his brain since he was born. People affected by Cerebral Palsy including Makara have difficulties to perform everyday life actions. Makara was sent to the hospital when he was four months old. However, the prescribed medicines did not help him to perform any better, but it weakened and prevented him from being involved in daily activities. In 2012, Makara’s parents heard about Kien Kleang Rehabilitation Centre and the family have been receiving assistance from the organization ever since. Makara has been receiving treatment properly from a physical therapist with the help of a round walker so he can now move his muscles more easily. Makara is now able to eat and shower by himself without his parents assisting him. Makara’s mother always accompanies him for a daily early morning walk. Makara was enrolled in a faith-based school and he is now in grade one.